Insurance Delay and Deny Strategies: I’m personal injury attorney Richard Griffin, and I know that personal injury victims have a lot of hurtles and challenges to overcome during the personal injury claims process. The bodily injury adjusters use aggressive delay and deny strategies to save the insurance company money at your expense. Delay accepting liability for the accident pending a lengthy “investigation”. Denying liability based only on the statements of their insured even when the police report found their insured to be at fault. Denying liability based on the statements of the personal injury claimant in a recorded statement. Refuse to authorize or pay for the medical treatment you need during the treatment. Assist you in obtaining the needed medical treatment and diagnostic testing using your med pay, health insurance, a doctor lien, or a medical funding company. Obtain the medical documentation (records, narratives, cost projections, impairment ratings, etc. ), lost wage documentation, police reports, and traffic and DUI dispositions. Utilize the deadlines created in Georgia law for providing policy limits information and for responding to settlement packages (demand packages). Assist you in obtaining loans when necessary from Settlement Funding Companies. 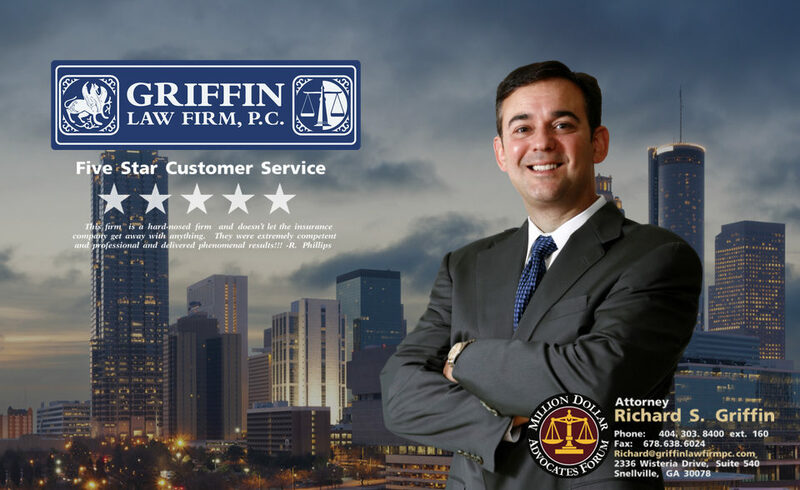 Free Consultation: Attorney Richard Griffin and the Griffin Law Firm will gladly answer your legal questions about your personal injury, wrongful death, worker’s compensation, or social security claim if you call us at 877-529-7070 or 877-PAIN-LAW. The Settlement Calculator utilizes the specific facts of your case, the damages in your case, the types of injuries you suffered, Georgia law, our legal experience, and when necessary jury verdict research to project a likely settlement range for your case.